There’s a shortage of good user experience designers. It’s not going to go away anytime soon, but it’s something we can fix. Resourcing challenges make sense in places like Cleveland or North Carolina where local UX talent is in its early stages of development. Cities like Los Angeles and Vancouver, however, are losing a lot of local talent because there aren’t enough opportunities for designers to develop their careers. UX leaders need to build the farm system in their respective cities and cultivate opportunities for designers to stay. Are they a great cheerleader for user experience, but aren’t highly skilled? Are they running the group only to benefit their career and no one else’s? Would you put them in front of C-Level executives to talk about the ROI of effective design? Can they put together a five-year plan for growing membership and work with local businesses to create more opportunities? If the answers to any of these is “no”, there’s a need for leadership change. An example of the right kind of leadership is NELAUX (Northeast LA UX). Led by Jon Fox and Petra Wennberg Cesario, they have built relationships in Pasadena with Art Center College of Design, CalTech, Innovate Pasadena and Internships.com to participate in programs that will create more technology jobs. The key: More technology jobs mean more User Experience Jobs. The best example I’ve seen lately is Paul Sherman’s efforts in Youngstown, Ohio. Paul, a past president of the Usability Professionals Association, is working with a business incubator. He advises startups on the block and tackling of User Experience. His reason? He wanted better Chinese restaurants. “We moved here three years ago because my older in-laws needed care and assistance from our generation. We’re just at that age, I guess. While Northeastern Ohio has some tech companies, there is definitely not the amount and depth of UX talent here that you’d see in Research Triangle, Austin, or even Cleveland,” said Sherman. He figured if he could help encourage more startups to move into Youngstown, the number of restaurant choices would increase. Youngstown’s low cost of living and ideal location (Carnegie Mellon and Youngstown State University are among many colleges within easy driving distance) make the town a great place to develop talent effectively and cost-efficiently. That means User Experience opportunities. We need to work with incubators that fund sustainable ideas. Social gaming isn’t sustainable. Simple e-commerce sites aren’t sustainable. Enterprise applications and consumer products that solve real problems are, and those are the opportunities we should pursue. There’s nothing that hurts User Experience designers more than the six month contract. Can effective products be developed at organizations where the financial commitment for developers and designers is different? The contracts expire, corporate rules take hold, and designers can’t apply for full-time positions — not only in that group, but the whole company. If you have to take that contract short-term to pay rent, it hurts your long-term career prospects and your portfolio. There are legions of designers with portfolios full of wireframes and nothing else. I’ve seen designers with ten years of experience and yet their portfolios shows less process than graduates straight out of school. In certain cities, like Los Angeles, it’s chronic. Agencies retrofit wireframes into concepts. It’s not unusual to see a firm advertise for a two-day engagement to show that they performed research. As an industry, this is unsustainable. Many organizations have legions of developers they hire on a full-time basis, yet don’t accord the same benefits to designers. This raises the question: can effective products be developed at organizations where the financial commitment for developers and designers is different? We need to give designers a chance at the full design and development lifecycle. We should push for more full-time positions because it increases opportunities for designers to learn and grow. The biggest complaint I hear about local events? Too high level with content that isn’t actionable. More presentations on Lean UX, Guerilla Research, and prototyping represent skills that many employers want, and what many designers want to hear about. Designers would benefit from events that handle the nuts and bolts of doing user experience. More presentations on Lean UX, Guerilla Research, and prototyping represent skills that many employers want, and what many designers want to hear about. Seattle’s UX Meetup Group events cover all ranges of the spectrum. Designers in the Pacific Northwest are very serious about doing great design, and it shows. Events like the portfolio review are much more valuable for most designers than going into the intricacies of elaborate taxonomies, a challenge they may see only a few times in their career. It’s not enough to just hold events. We have to be better leaders, better mentors, and reach out to local businesses to prove our value. Doing so will benefit all of us short and long-term. Building a Product? This Is The Team You Need To Build Your MVP. You and your friends have this great product idea. Bigger than Instagram! Bigger than Twitter! Bigger than Facebook! Bigger than Google! Okay, maybe not. Still, it’s going to be huge. You’ve raised a little money (if you’re lucky), and you want to build a MVP, known as a minimum viable product. That’s the bare minimum you need to get a product out the door and so you can test your concept against customers. Even for a MVP, it takes a village to build a product. The village has several roles, and selecting the right team early can make or break your idea. Your village will never be of an ideal size, but understanding what you need from your townsfolk can help you make some hard decisions on how to staff the team. Early on, flexibility is the key. You may also have to split up the work if it’s a side project and everyone has a day job. Even for a MVP, it takes a village to build a product. The village has several roles, and selecting the right team early can make or break your idea. The composition of the ideal team has been a question that’s been on Quora, and great advice can be traced to a simple model that Dave McClure of 500 Startups advocates — Hustler, Hacker, and Designer — but it has to be viewed within the context of what you’re building. This article covers all the roles that go into building a product, and places where you can “cheat”, i.e. fill in with people that are in other roles. Minimum viable product projects are about building something to a level that gets you started, within extreme constraints. Zappos did it that way. So did Groupon. CarsDirect launched over a weekend. You can too. And remember, it’s just not about the MVP, but planning for something bigger: use team members that can play multiple roles now, so you can grow and expand later. If your friends can’t perform the vital tasks of Sales, Marketing and/or Business Development, they might not be a good fit. The team will also vary depending on your idea — the roles needed for a tech-heavy idea differ significantly from something like Groupon or Uber, which are more sales driven. Following are the typical roles of any software development team. Each is essential to the success of a product. Each is priced pretty close to the others, depending on experience level. And each needs to be filled by someone who can perform that task. For example, if you don’t have someone in the role of UX Designer or Product Manager you’re still doing the tasks associated with that role — you’re just doing them poorly. A Product Manager is exactly how it reads: they manage the development and the feature set of the product. It’s the ultimate jack of all trades position: they play several roles, but never have time to do any of them at an expert level. They should be competent at a lot of things, like writing copy and distilling customer feedback. They own tasks that are pure strategy, like pricing, product roadmap, and product marketing. There are also tasks that are tactical, like day-to-day program management, and making sure everyone is marching in the same direction. That means having a lot of diplomatic skills, because everyone feels like they own the product with an MVP. Great product managers have to understand technology, the business and the user — at the same time. If they don’t, they will be thrown to the wolves quickly, unmercilessly, and rightfully so. A product manager that doesn’t gain the trust and respect of the team is in trouble from day one. The ultimate test: being able to speak to the business, to the user, and to the technical solution at the same time, and lead without having direct reports. That’s hard. Product managers should know how to prioritize their time and to delegate appropriately. If they’re working 60 hours a week, they probably aren’t very good at their job. What job titles should I look for? Product Manager, Program Manager, Project Manager. Some project managers have skillsets that are too narrow for Product Management. Should I outsource it? Absolutely not — this is the idea role. If your idea is about user acquisition early on, you can skip some of the business modeling or hire someone else to do it. However, understanding your market is essential to the success of your MVP, because it’s going to change, a lot. Who else can perform the role? A good Interaction Designer can cover 60 to 70 percent of any product manager’s role, so someone with that background can do it. One of the founders, possibly the idea guy, should be this person because they’ll care the most. The hustler can also bring ideas from the customers — the key is mining those ideas for great product features. When should I hire this as a full time position? It depends. Early on, they should be playing other roles, like business development. In some organizations, a designer or engineer might also be acting as a product manager. They act as project management, and with the interaction designer, should be the hub of activity. The best staffing model is one product manager for every three to six developers. What keywords should I look for in resumes? Most product managers should have a portfolio of products they can point to at being successful at. Look for the following keywords: Research, product marketing, product roadmap, copywriting, pricing models. Interaction Designers are the people who design a product that will encourage adoption, engagement, and hopefully profitability. They are essentially the product architects — someone that describes the structure of what you are doing so everyone else can fill in the blanks. Great User Experience designers are OCD about developing products, because the user is who matters most. Great User Experience designers are OCD about developing products, because the user is who matters most. No engagement and no adoption means no startup, right? They are trained to build usable products within established constraints, and usually are more familiar with the development process than most product managers. A good interaction designer will save you time and money because they’ll test features quickly with prototypes and say yea or nay. Getting actionable data early and often is invaluable for MVPs. What job titles should I look for? Interaction Designer, User Experience Designer, Product Designer, User Researcher. Should I outsource it? Risky, but it can be done under the right circumstances. This tends to be the hardest role to fill because good Interaction Designers are hard to find, and they like getting paid. This can also be the most essential role in a design-led organization, so depending on your needs you might be better off hiring a designer that can manage product than vice versa. Who else can perform this role? You can hire a Visual Designer to do interaction design — many visual designers also claim interaction design as a skillset — but there might be an early emphasis on pretty over functional in the product, and this can mean death. The floors of the startup world are littered with the very pretty corpses of non-functional ideas. Or you can learn to do this yourself (This Triptrotting story is an example of founders that learned how to wireframe), but it’s really, really risky. Would you trust your open heart surgery to your cousin? When should I hire this as a full time position? It depends. A great part time interaction design consultant can dramatically improve the product, but this also means they have no skin in the game. If they are acting as the product manager (many go this route), one interaction designer for every four to eight developers seems to work best. Pairing up an interaction designer with a product manager is ideal. What keywords should I look for in resumes? Most interaction designers have an online portfolio, and should be able to explain their projects well. Look for the following keywords: Wireframing, Prototyping, User Research, Omnigraffle, Indesign, HTML, CSS, jQuery and Prototyping. Visual Designers create the look and feel of the product, and are sometimes called upon to establish the the brand voice. They select the colors, the icons, and define the look and feel that will be implemented by developers. Visual Design is the trickiest skillset to define because it is the most in flux in today’s responsive design environment. Whether we like it or not, visual designers are being called on to do more of their work in HTML and CSS than Photoshop. The workflow from interaction design to final product should contain the fewest steps possible, and a visual designer that can’t function in HTML creates delays. Most MVPs can survive without a visual designer early on. Resources like 99 Designs can be used, the front end engineer can hack together something. Remember, it’s about testing the idea with a controlled audience. That initial pretty design you think is so important for the first version — it just isn’t, because you’ll be changing it over and over again. Some websites have gone strictly with a design that looked like wireframes and launched that way, learning and designing as they went. That initial pretty design you think is so important for the first version — it just isn’t, because you’ll be changing it over and over again. Trust me. What job titles should I look for? Visual Designer, User Interface Designer, Web Designer, Graphic Designer. Should I outsource it? Maybe. With an interaction designer or product manager that’s solid, they can manage an outside visual designer to come up with some great work. If you’re really strapped, you can go the 99 Designs route, but this may take more time than if you’d done it yourself. Who else can perform the role? In smaller teams, Interaction Designers perform the Visual Design role. Some are opting for generalists with a visual and interaction design background. Many don’t need a full-time designer until late in the game. However, if you’re a consumer product, this should be one of the first hires. The best ratio is one visual designer for every four to eight developers. What should I look for in resumes? Most visual designers have an online portfolio. Look for the following keywords: Illustration, Photoshop, Illustrator, HTML, CSS, jQuery, Prototyping. Writing copy is the redheaded stepchild for any product. No one really wants to write copy because it’s so time consuming, but without it, usability and engagement is severely hindered. Copy is as important as the visual look to setting the tone and brand. Establishing this early with a single resource that can perform consistently is critical. Copy is as important as the visual look to setting the tone and brand. If you’re lucky, you’ll find a resource that can do both marketing and content development, solving both problems at the same time. A few members of the team will probably be contributing to this process. Also, consider this: the product you are building now most likely isn’t the product that will become your startup. Copy and design will be changed early and often. What job titles should I look for? Copywriter, Technical Writer, Marketing Manager. Should I outsource it? Maybe. Using someone in-house takes away from time they should be spending on something else (you know, like selling). A common solution is to write the first draft in house, and then hire a professional copywriter later on to revise the copy. Who else can perform the role? Interaction Designers, Visual Designers, and Product Managers should all be able to write copy. For many, this will never be a full time position unless it’s a content-heavy site. What should I look for in resumes? Great writers should be able to tell their story in a compelling way. Look for the following keywords: Copywriting, content strategy, marketing, lead generation. Someone has to build it, right? Developers are the people who take the dreams of product managers and designers everywhere and turn them into a working product. If they’re good, they can cut time to market from months to weeks, and give you a minimum viable product that you can test user assumptions against. If they’re not so good, they’ll kill your idea. Building smaller, agile development teams can be better than building a massive team, because each additional member increases communication overhead. The developers that you hire should be on the same page with each other on what platform to use and how to build it. Building smaller, agile development teams can be better than building a massive team, because each additional member increases communication overhead. The best developers know how when to roll their own (build custom code), and know when to use frameworks. If they’re rolling everything custom, that tends to be a really bad sign unless it’s an extremely complex application. Developers tend to come in two flavors: front-end and back-end. Ideally, the developers should be full-stack: generalists that can play on the front-end or back-end, but it may vary depending on your needs. And you have to watch out for specialists. If they are an architect, they may be rusty in coding. If they’re primarily a front-end developer, they might not know back-end development at all. Back-end developers are skilled in languages that connect to databases, like Java, .Net, PHP, Python, and Ruby on Rails. They should also have some database knowledge, and that could be anything from MySQL to Mondo DB. Their primary goals are to make the system flexible for future development and fast for current performance. Data structure is crucial: I’ve seen many a startup killed by poor database decisions. What job titles should I look for? Software Developer, Software Engineer, Front-end Developer, Front-end Engineer, Software Architect. Should I outsource it? Possibly. With strong project management, it can work, but it’s risky. Sometimes you can hire some in-house developers, and they’ll manage the outsource team. Any outsource development team, however, has very different goals (increasing billing amounts) than you do (building your idea for the lowest cost possible). Ideally, I would have one architect or senior-level developer that has skin in the game. Additional considerations include whether you should buy or build technology, or the complexity of the application. The fewer the variables in the business model, the easier it is to outsource. Who else can perform the role? I’ve seen product people with development backgrounds, but the roles are so different that it’s hard to combine this role. Developers should be focused on building and testing code, and nothing else. Sometimes front-end development can be handled by the visual or interaction designers, but that’s not an ideal situation. When should I hire this as a full time position? Most make their early recruits engineers, because if you can’t build it, you can’t launch it. However, with careful project management, I have seen some outsource their development. If your product is not truly technology based, it might be better to use consultants. What should I look for in resumes? Well executed, completed projects where they worked with a team. Ask for demos. Look for the following keywords: Ruby, Java, PHP, Python, .NET, MySQL. Also look for projects that have similar business goals as your product idea. Someone has to make sure it works, right? Any good Product Manager or Interaction Designer should be able to put together a test plan that anyone can follow, or even better, you’re doing test-driven development and the engineers are writing unit tests. However, that’s an ideal scenario. If everyone else is busy, there are dedicated Quality Assurance resources you can hire. The best analysts I’ve met act almost as an additional product manager or interaction designer because they become gatekeepers for great product development. They help establish process and goals in a chaotic environment, and work to ensure steps are taken to deliver a good product. What job titles should I look for? Quality Assurance Engineer, Quality Assurance Analyst. Should I outsource it? Maybe. If you’re lucky enough to find someone that’s super detail oriented, it can work. But you can end up doing this yourself and wasting money in the process. Who else can perform the role? This can be the “all hands on deck” role. The interaction designer, product manager, or developers can write test plans and go through the steps of making sure the product works. When should I hire this as a full time position? This can wait because other roles can test early on for most products. I would hire it as the 10th or 15th member of the team. The number of developers establishes the staffing level for the rest of the company, and is determined by what kind of business you’re in. What should I look for in resumes? Test-driven driven software development processes, and ideally a perfectly laid out resume without typographical errors. Look for the following keywords: Agile, automated testing, test plans. Even better, play with this spreadsheet I’m developing around this topic, and then send me note. A great video. Worth watching. A couple of years ago, I was interviewed by Venture Beat for an article about Google Plus. I firmly believed that large-scale user adoption for the social network was around the corner. It seemed to have a great feature set, and with their search engine they could drive significant traffic to the social network. 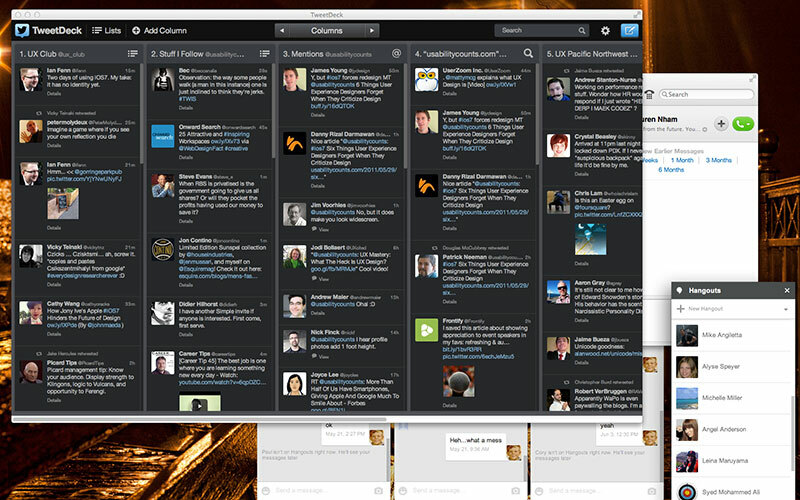 The only people I see on my feed are Chris Pirillo, Robert Scoble, and three Google employees I know. With its relaunch, I don’t know now if Plus is ever going to take off. They can’t seem to bridge the gap between using their data to optimize a tool and how to use it to encourage social interaction in many of their applications. Some features, like viewing the content, seem to be a direct rip-off of Pinterest. Google Hangouts look great when you first use it, but chat isn’t very usable with repeat usage. A lot of the products released during Google’s #io13 were beautiful and not usable at the same time, and they all seem to lack a social component. A lot of Google’s products have that same social disconnect. They can’t seem to bridge the gap between using their data to optimize a tool and how to use it to encourage social interaction in many of their applications. Very few people I meet say they “love” their Google products. And that’s the problem. Their Android phones are usable. They like using Google search (or use it by default). They use the mail products. But when I ask if they “love their phone,” there’s usually a pause. They’ll love a feature or two, but do not have an emotional connection to the product itself. Great products create emotional connections that go beyond their utility. People love their iPhones and love them so much that they buy other Apple products. Driving their BMW or Audi is an “experience.” This shows in Net Promoter Scores, where Apple scores in the high 70’s range with many of Google’s services at the bottom of the charts. Emotional connection can’t be measured. It can’t be optimized through A/B testing, it is discovered through qualitative research. I watched a grandmother interact with her grandchild electronically — the use of FaceTime to visit with someone who’s three time zones away, and doing it in a way that you could see the human value in their interactions was amazing. That moment for me was a realization that the product had become a way to enable human experiences. The technology itself had disappeared from the process. Emotional connection is important because it gives companies leeway on building products that aren’t as successful. iTunes isn’t easy to use. iCloud may have widespread user adoption, but confuses the user. Ping was shut down. However, it doesn’t hurt the larger brand, because consumers have an emotional connection with Apple and most of their core products. There’s not a single Google tool I have an emotional connection with when I use it. There’s not a single Google tool I have an emotional connection with when I use it. I’m typing this on a Chromebook. It’s nice, but I don’t love it. I have Gmail. It’s easy to use, but I don’t need it. I wrote this in Google Docs, but I could use other tools. I use Google search because it has more indexed pages, but I could Bing. I need my iPhone. It’s emotionally connected to my life and makes my life easier. Therein lies the difference. Google design new tools or redesigns tools that already exist and make them much better. That’s not a bad thing, but they’re designing for efficiency and not delight. Maps is a great improvement over previous applications (better than Mapquest and Yahoo). Search finds content you want or need, and can almost predict what you are looking for (better than AltaVista or Lycos). Their advertising tools are great at drilling down to what is the best return on investment for your dollar if you’re a small business. Google tests everything, because removing that one extra click could mean making millions of dollars. They are great with taking vast amounts of data and presenting it in a way that we find useful, at optimizing searches so there’s always one less click. They hide complexity so we can find that page about the “hamster dance” right now. But not everything about the web is about utility. Humans like discovering new things, searching and playing. The best discovery platforms show us not what we were looking for, but what we didn’t expect to find. This requires developing a human connection. Facebook has a lot of that element: I’m not looking to find the photos of my friend’s party when I get there, I’m looking to find out my friends’ attendance. Pinterest is about discovering that new handbag. Instagram is about sharing our lives, one photo at a time. That’s why each has succeeded — there’s a particular human connection that goes past “is it a hammer or screwdriver” that Google seems to miss. This is an example of Google Hangouts within context of my second screen. The multiple windows clutter the screen, and make it hard to manage chats. This is an example of something that you see only with ethnographic research i.e. watching people in their own environments. This is especially evident in the Google Hangouts application. As chat windows open up, window after window appears at the bottom of the screen. If you’re chatting with several people, you could have up to six windows competing for your attention at the bottom of your monitor. The problem? Chatting is something that is often a passive activity that you do in between all of the other work you do on your computer. You may be chatting with someone at work, a friend, or maybe even sending files. It’s something that happens “in between the raindrops,” the other work you are doing. It might be happening on a second screen at home while watching television, or at work, or while waiting for a friend. It’s a passive asynchronous distraction, not an active task. Multiple chat windows works for Facebook because it happens within the context of a single environment — the Facebook browser tab. Once you hide this browser window, it’s out of sight and mind, but still accessible. Several other applications that I use, including Skype and Adium, all minimize screen real estate but still add notifications within the Mac OS X dock — out of sight until I want to solve it, within context. Messaging software is not something you can actively test in a usability lab, because it’s unnatural there. Most of the time, when testing software this way, you are focused on certain tasks. They have to be tested under real world conditions (read: on-site visits) over hours or days of study of many real world users. Many of the applications you use Google for (Maps, Search, Mail come to mind), are oriented to single tasks where the user’s attention is focused. The applications where the user’s attention is so unfocused (Hangouts and Google Plus) are where Google is struggling. Google has taken vast amounts of data and made it extremely manageable, even if it means dancing on the edge of violating our privacy. The best example of this is Google Maps versus Apple Maps. The first version of Apple Maps was destined to be a trainwreck because Apple didn’t know they were solving a data problem, not a user experience problem. Users don’t want three dimensional renditions of their neighborhood — they want directions from 8th Avenue and Judah Street to Stockton Street and Columbus Avenue, and they want to know if they should be driving, taking a bus, or riding a bicycle, not what buildings they’re going to pass on the way. And they want to know it now. That takes managing a vast amount of data. Which is exactly what Google is best at, and isn’t Apple’s core competency. Apple’s busy trying to fix it, but Google has a several year head start, and their culture is built around values that make it easy. With many of Google’s services, cognitive dissonance is required: collecting that information is of great utility, but it requires collecting more information than we are comfortable with. With many of Google’s services, cognitive dissonance is required: collecting that information is of great utility, but it requires collecting more information than we are comfortable with. We justify it in the moment (“How do I get to North Beach from Inner Sunset safely so I can have a drink at Tony Nik’s?”), and get upset about it when the usage of that data is disclosed (“Do they really track every time I do a search for a bar?”). The people that work there are comfortable with this because they believe this information should be open. Google employees don’t have the same concerns about privacy as normal people because they are surrounded by unlimited access to data every day. It’s their culture. You could almost say that Google’s mantra of “Don’t be evil” is in direct conflict with who they are as a company: primarily an ad-driven business that optimizes everything based on knowing every user’s behavior and storing it, forever. Many of their tools feed into this goal, and this is why Google Plus is such a painful fail. They understand the value of social data. The failure seems to be that while they understand the value of social data, they can’t figure out how to use it to actually engage users in social interactions. It’s quite ironic, really. Their mantra comes off of a disingenuous when compared to their core business. Users inherently distrust the company because we don’t want one organization knowing so much about us. As much as Google wants to be soft, fuzzy and social, they almost can’t. Google Glass is a great example — there will be a successful technology that will come out just like it, but it won’t be from Google because of privacy concerns. Which leads to the next point. The average technology worker in Silicon Valley has more in common with a farmer in Africa than a housewife in Iowa. When you live in the Valley, you forget that not everyone uses iPads, Smartphones or all kinds of other technology. A lot of people make do with their three year old desktops, and they stay off “The Facebook.” I see this in Seattle, where there seems to be significantly less use of technology than in San Francisco. This problem is especially exacerbated at Google. The employee referral rates I have heard are in the high 75 to 80 percent range. People that work at Google are referring people that are like them, which creates a very homogenous culture. They are smart people, a lot of them from Stanford and Harvard, and they are probably great problem-solvers. But they aren’t hiring people from different backgrounds, with different viewpoints, and it’s creating a culture that is less about making truly diverse products and more about feeding the machine. This is a problem faced not only by Google, but by every company in Silicon Valley. They have lost the connection to “the common man.” The common man doesn’t make $150,000 to $250,000 a year and take a company bus everyday down to Mountain View. They are insurance sales-people, car mechanics, housewives, and teachers that go home after work to watch “CSI: Miami”, not explore the town with Google Glass. They are my parents that have learned how to use an iPad, but do it to play Words With Friends. An example of a market missed with Google Hangout is FaceTime users. Google might capture that market because they offer group video chat, the only major platform to do this for free. They will succeed not because of the emotional connection, but because they are the freely available option. Thus their success will be accidental because they aren’t aiming for that market. Apple’s FaceTime promotional content emphasizes pictures of families. 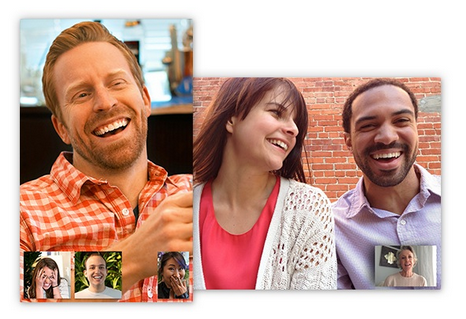 Google Hangouts emphasizes friends, without a single image showing family. The most telling point: view the FaceTime and Google Hangouts marketing, side by side. 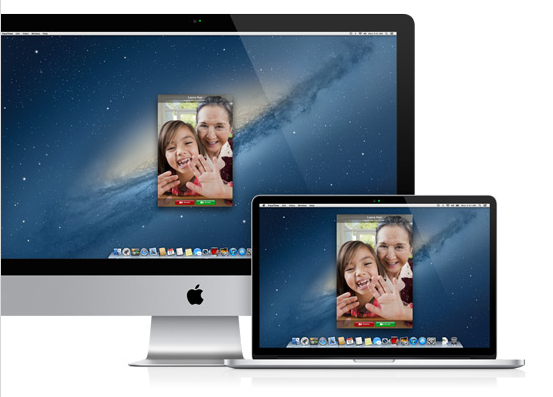 FaceTime emphasizes children and family without even mentioning who you’re calling. Google Hangouts emphasizes friends over family, and has twice as many screenshots of chats than faces. To design for consumers, you have to have people on your team that are the target audience so you can design for it. The users have to live it. Many other places, like Apple, Facebook, and MySpace (during their height), have that: the people that are in product development are also the target audience. Jony Ive, for example, succeeds because he reflects a segment of the population that loves simple, well-designed products. Facebook first attracted an Ivy League, more affluent audience because that was their initial product team. They understand their target audience because they are their target audience. Can Google build an emotional connection with their customers? I don’t know if they can ever fix it. Many of the issues above are ingrained in their culture, and culture is really hard to change if you’re as big as Google. Great companies develop brands that have an emotional connection with their customers, and this is something that marketers talk about endlessly when constructing their marketing programs. I saw this at Jobvite — the most devoted had an emotional connection with their product, and would bring it with them wherever they went. They were evangelical about their devotion to their product through thick and thin. Google doesn’t seem to have it, because that’s not how they have built their company. You can’t optimize for culture. But it does create opportunity for other startups. It’s a great cautionary tale when designing stuff for people — you have to not only understand them, you have to be them to really understand their needs. UX Mastery: What The Heck Is UX Design? Matthew Magain is a UX Designer down under (Australia) and runs UX Mastery. He put together this great video explaining UX Design. Cheers. When I speak at events — I just recently returned from SoCal UX Camp — I’m always surprised what I get asked after the presentation. I put the deck online (that’s usually the first request), but much of the information I disseminate is of the spoken variety. I’m kind of like Michael Stipe, who is famous for forgetting lyrics. Every time I do the presentation, I might say something different because I don’t have a script. At the last few events, there’s been a line of people that wanted to talk to me after the presentation. I do these events for personal branding and because I love reaching out, but I can’t help everyone. The people I love helping show an effort at getting to know me. They also ask great questions that go beyond the standard, “How do I write a resume.” They show they’ve researched. Anyone can do this. Based on my personal experience, here’s a few things that will help you make friends with speakers and make them your advocate. The first thing any interaction designer should do to prepare for a conference is research the speakers. The schedule for most events is usually up on the website for a month or two before the event. If there are particular speakers that you want to interact with, research them. Read their twitter feeds, go through their blogs, find out who they are and what information they are disseminating to their audience, and know it so you can comment it. You don’t have to read all of their stuff, but be familiar with what they are saying. What frustrates me is that I have roughly 45,000 words on my blog on the topic of writing resumes and UX careers with a big fat button that reads “UX Career Guide,” and no one seems to read it. When you search for my name, I’m roughly the first five pages of results on Google. Many of the posts are for my blog. I still routinely get the “How do I make my resume better” or “Where do I find the resume template” questions. Please, read and research! The first thing any interaction designer should do to prepare for a conference is research the speakers. Know how you can make me your best friend in the world? Talk about how you love the UX Drinking Game and share it with your friends. Almost every single designer I know that hits the road on the speaking circuit has some kind of side project. Sometimes it’s a labor of love, or it might be an end goal for their career, but showing that you care means a lot. I have the UX Drinking Game, something that I have spent a considerable amount of time and money building into what it is today. I’m neurotic about everything I do (at least everyone said I did a good job this weekend) because of that INTP thing (I’m very introverted, and I need data for most decisions). Positive feedback means a lot. Do they have a book for $19.99? Are they doing a low-cost class? Do they have an application or two in the iPhone App Store for $2.99? Do them a favor — buy it. We try to price these items at a price point almost anyone can reach, and many of us see sales or site engagement as how we are providing value to the community at large. We may love User Experience, but it also pays our bills. We try to price these items at a price point almost anyone can reach, and many of us see sales or site engagement as how we are providing value to the community at large. Some speakers actually pimp out the work of other designers. I spoke highly about Russ Unger’s A Project Guide for UX Design Saturday, and I’m starting to use Laura Klein’s book UX for Lean Startups for startup types. I have a library of books by other designers that I routinely speak about and share at events. Many speakers hit the circuit specifically to sell books, and after a while the flights and hotels get to be draining. I’m not saying you have to go to every $1,400 event that comes along, but spending $19.95 for an eBook doesn’t seem to be much of an ask. The best conversations I have had at events have been outside of actual sessions. It could be a coffee or a whiskey, but a small token of appreciation is awesome. The best conversations I have had at events have been outside of actual sessions. At the SoCal UX Camp, a designer with a sociology background, Sara De La Cruz, offered me a cup of coffee. We had a wonderful conversation at a nearby coffee shop about how our careers were similar, and we talked through great ideas about how she could make a career shift to UX design. I offered several suggestions, and further questions showed that she was really taking steps to break into the field. It wasn’t a long conversation (I think about 30 minutes), but with that small sign of gratitude she gained a friend for life. And the drink didn’t even have any whiskey in it. Your cards should list your name, what you do, and a contact method, like your Twitter address or website. In our virtual world, I know it sounds kind of odd, but a small card is a great way to introduce yourself. There’s almost no friction, it’s an easy way to make an introduction. They don’t have to have your business on them. I paid something like $40 for mine, and I think they look great. Your cards should list your name, what you do, and a contact method, like your Twitter address or website. It also works with recruiters — if you meet one at an event, you can give them a business card and they’ll usually reach out to you the next week. Another thing — I remember faces, but I have a really, really hard time with names. If you meet me, ask me about the time I forgot a C-Level manager’s name, six months after working at the company. If you’re an interaction designer that has done a bunch of work, or want to be one and have relevant experience, I want to talk to you! We can discuss your difficulties in finding a job, and you become an ideal candidate for user research. If you have just graduated college and have three college projects in your portfolio, or you’re a used car salesman that’s never touched Dreamweaver or Omnigraffle before, I can’t help you. There are a ton of resources on the web that talk about how to prototype, start side projects, and learn about the field. If the first question you ask is, “How do I break into User Experience” I know you didn’t do your research, because the first few results on Google include an article that I wrote on the subject. User Experience is not a passing hobby, it’s something you have to live and breathe. That’s an investment. Respect ours. This is the presentation for the SoCal UX Camp. Also recommended is the UX Career Guide, complete with a resume template you can download and use. Cheers!